Besides its new icon, the biggest changes in iOS 7's Safari are its new unified smart search field, its goal to keep the browser’s interface minimized whenever possible, new navigation gestures, a new tabs view, shared links, and quicker access to private browsing. Apple’s Web browser is lighter and cleaner than its past versions. In OS X 10.8 Mountain Lion, Apple followed its Web-browser competitors by offering a single bar atop the browser window. Instead of sporting both a URL field and a search field, Safari on the Mac in OS X 10.8 (and beyond) presents a single field that performs double duty, accepting URLs and search terms alike. The .com button is no more—but you can find all its options by holding down the period key. As you type in searches or URLs, Safari will offer up search-result and URL suggestions beneath the field. You’ll get search suggestions from your default search engine, along with matches from your bookmarks and history. Tapping the search/location bar also reveals the bookmarks in your Favorites folder, presented in a grid and represented with their respective favicons (or, for folders, a folder icon). On the iPhone, Safari is eager to fit more of the current webpage on the screen. 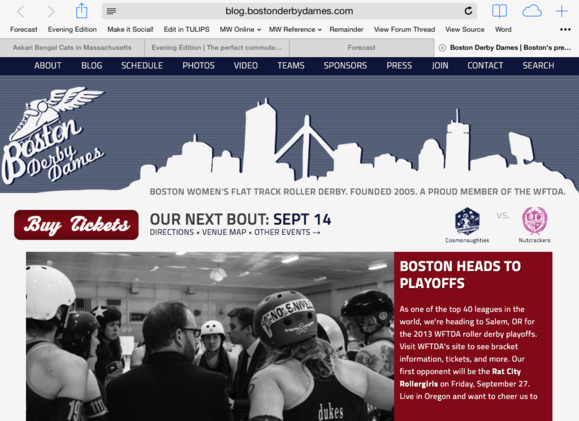 As you scroll down the page, the search/location bar shrinks down to a very slim bar that displays just the domain of the webpage, and the toolbar across the bottom vanishes. Alternatively, just scroll quickly a bit toward the top of the page, and regardless of how far down the page you are, Safari figures out what you’re after, and the interface elements reappear on their own. Even if the bottom toolbar isn’t on the screen, you can easily navigate between visited webpages—you don’t need the back and forward buttons. A swipe from left to right slides the current page off the screen, revealing the previous one in your history, seemingly waiting just off-screen to slide back into view. You can swipe the opposite way to go forward in your history. 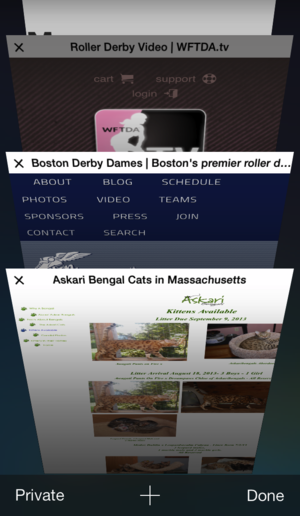 Quickly find the page you’re looking for by using Safari for iPhone’s new tabs view. When you tap on the tabs button in Safari on the iPhone, you’ll see a new, pseudo-three-dimensional view of your open pages that you scroll through vertically. (You can close any page by simply swiping it to the left and “off” the screen.) The iPad has no such view; instead, your open tabs appear, as in iOS 6, in the tabs bar below the search/location bar. If you open more than eight tabs, ellipses appear next to the far-right tab. Tap it, and you get a drop-down list of other open tabs. On a couple of screens within Safari—the tabs view on the iPhone, Favorites view on all devices (though often hidden by the keyboard on an iPhone or iPod touch), and the search/location-bar text-entry screen—you’ll see a new Private button. Tap it, and you can choose to enter Safari’s Private Browsing mode, which doesn’t let websites access your cookies or track you, and doesn’t keep a history of the pages you visit. Previously, you could access this mode only by trekking deep into the Settings app.